You will be given a reference e-book to read which has 240 pages And the test will be based on that e-book , you can take final test within 1 year of purchase. Event managers are people who are tasked in planning and executing events. Most of them work with a team composed of people who are also experts in managing events to make sure that the events that they have planned are executed in the most efficient manner possible. Aside from planning and executing events, event managers may also perform other vital tasks including brand building and using effective communication and marketing strategies. If you are an aspiring event manager, then you have to be serious in improving your creativity, your technical skills and your skills in effectively using logistical elements when it comes to planning events. You have to familiarize yourself about all the elements and concepts linked to planning events including scriptwriting, event design, logistics, audio and visual production, client service, negotiation and budgeting. A certified event manager is also responsible in making an event’s early initiation stages successful. During this early stage, the event manager will have to formulate sound and crucial decisions associated to the creative designs and concepts of events. If you are serious about taking up an event managers course, then you have to be committed in gaining a more in-depth technical design knowledge while also completely understanding all the strategies linked to communicating the message of a company to the public especially if the event is promotional. 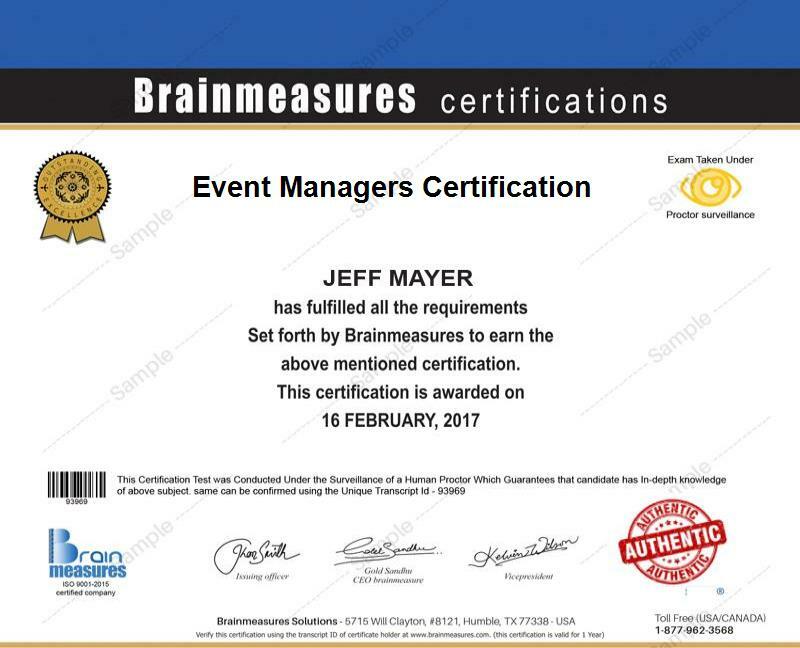 If you want to become one of the most renowned and formidable event managers at present, then you should consider taking part in the event managers certification program which is now accessible in a reputable online certification company called Brainmeasures. Regardless of where you are, you can take part in the detailed event management training provided by the certification course since everything is done online. You have an assurance that Brainmeasures is a legitimate company because it has already received its ISO certification and it continues to stick to the rules and standards set by this international body. Because of the comprehensiveness of the Brainmeasures event managers certification program, you will never find it hard to understand all the concepts linked to event management and the tasks and responsibilities that you will be facing as soon as you practice your career in this field. An advantage of enrolling in this program from Brainmeasures is that the entire learning process is very convenient. You can get your event management certificate online as soon as you complete the program. This certificate will be your ticket towards getting solid and profitable event management jobs. The event managers certification course which you can now access at Brainmeasures aims to help anyone who wishes to gain a more comprehensive knowledge about how to successfully carry out the entire event management process. This is perfect for individuals and professionals who are in charge in managing and planning events including event managers / coordinators, creative directors, exhibitions and event logistics executives, public relations managers and project managers. If you have successfully completed an event managers certification course and you have already started your quest for a job which works suitably for your knowledge and skills, then expect to enjoy a more profitable pay. The average annual salary for event managers certification holders at present is around $48,000 to $96,000. There is a great possibility for this amount to grow after receiving more years of experience.